With its satellite program in Charleston, Clemson’s School of Architecture has the potential to offer students an extraordinary opportunity: the chance to study traditional architectural design in the heart of one of the world’s finest traditional cities. Architecture (the magazine) says there are “two parallel worlds” in architecture today: one devoted to “mainstream modernism,” the other to traditional architecture. Clemson's proposed new building in Charleston is in an anti-traditional idiom because Clemson’s School of Architecture is devoted to mainstream modernism; Clemson has no program in traditional architecture. But it could. Along with the College of Charleston’s Program in Historic Preservation and Community Planning and the American College of the Building Arts, Clemson’s Charleston architecture program could be at the core of a world-class Center for the Study of Contemporary Traditional Architecture. Contemporary Traditional Architecture in Charleston could be treated as an elective concentration, special topics or certificate program without interfering with the current curriculum at the School of Architecture’s main campus. Scheme A is organized around an open courtyard and a corner pavilion. The pavilion - a public Hall of Architectural Review - has piers which, along with those that support the adjoining ironwork, support busts of prominent Charleston architects. 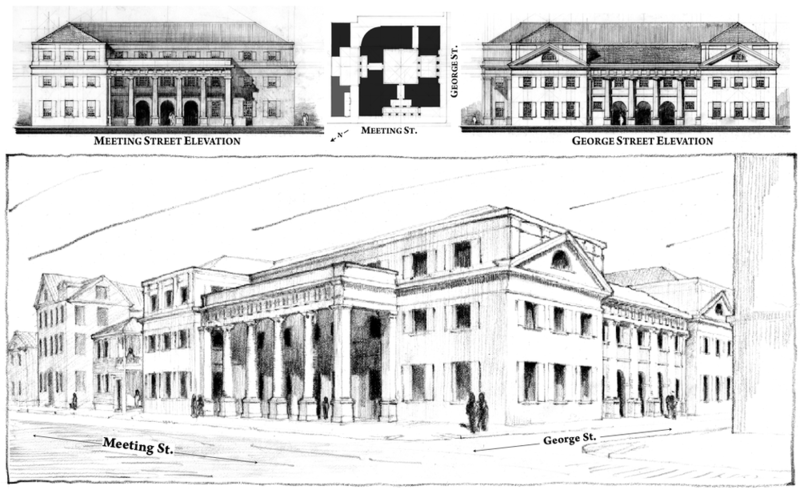 Scheme B is organized around an enclosed courtyard entered under a double-story portico along Meeting Street and a single-story loggia along George Street. Both schemes share a common design philosophy: Carefully designed combinations of stuccoed masonry walls, pitched roofs, timber and steel frames, and projecting eaves and moldings contribute to the buildings’ sustainability, as they are not only durable but also repairable and maintainable. Charleston’s climate is subtropical, so the buildings have narrow footprints and use loggias, porticos, and courtyards in order to take advantage of breezes and to provide shade. Large expanses of glass are avoided, and walls facing south and west have moderate window-to-wall ratios. Both schemes employ the minimal yet robust classical details which have been in continual use in Charleston for over 300 years and which contribute to a monumental character appropriate to a public building.